Take a tour of the big island! Savaii is a land of fascinating and beautiful natural sites. You will find a landscape shaped by recent volcanic activity, the sea, the lush tropical vegetation and fringed by beautiful beaches and blue lagoons. Hire a car, take a guided tour or book a taxi (if taking a taxi agree price and what is included first). Unless otherwise noted, sites are signposted. The island is 190km around so can be easily driven in one day; it is about 4-5 hours driving time without stops. Sites are located on customary land and a small access fee is payable in cash at each. If taking a tour, check whether access fees are included. Before setting off, stop in at the Savaii Tourist Information Centre in Salelologa for more information and maps. We are 100m from the wharf upstairs in the apricot building. Our tour below starts and finishes at Salelologa, but of course you can start anywhere. More detailed information is also in our section on the 4 Coasts. 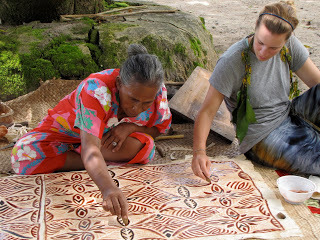 Taking a tour of the island with an informative, English speaking tour operators is a great way to see the island and get an insight into Samoan life. Head south past the wharf and take the first road to the right (approx. 1km from the wharf). Local vendors sell handcrafts, lavalavas, hats as well as takeaway food, fresh fruit, vegetables and fish. The extraordinary lava fields formed from the eruption of Mt Matavanu in 1905-11 destroyed villages and agricultural land. The Saleaula Women's Committee run a tour operation at the ruined Saleaula village including church buildings and the ”virgin’s grave”. The Women's Committee often have local handcrafts for sale. Savaii is one of the few places you can get up close to a green turtle. Turtles are hand fed and will come close to you if you get into the pool with them; alternatively they are clearly visible from the pool's edge. Green turtles are protected and the turtles are overseen by government fisheries and environment ministries. Larger turtles are tagged and released; one of these has been found thousands of kilometres away in the Solomon Islands. Savaii has been shaped by ancient volcanic activity and there are a number of wonderful lava tubes to explore. Stop at one of these on your tour. Local guides will provide torches. Just west of Manase are the dwarves caves. The caves are a 10 minute drive inland from the signpost on the main road. According to local legend this lava tube was home to an ancient race of dwarves. You can see the dwarves sleeping platforms along the side of the cave. Local guides will provide torch. Located in the village of Letui is the Pe’ape’a Cave, a lava tube that is home to the white-rumped Polynesian Swiftlet birds. Local guides will provide torch. Take care at the entrance as it is quite steep and can be slippery. High up and just outside the village of Aopo is one of Samoa’s most extensive lava tubes; locals tell us they have been unable to find the end even after walking 10 hours down the tube! The cave system is reached by taking a guided 20 minute walk through mahogany plantation and fruit and vegetable plantations and then through natural rainforest. Climb up through the banyan trees to the canopy walkway for a bird's eye look over this rainforrest preserve. Look for the sign on the side-road (it is easy to miss when travelling anticlockwise). Check pricing including any charges for parking before starting on your walk. Faleolupo is home to many Samoan legends and one of the most traditional and beautiful parts of the country; untouched by many western influences. The area was devastated by the 1992 Cyclone Ofa with many ruins still visible. Faleolupo was until recently the last place on earth you could see the sun set into the ocean each day, now it is one of the first! Stop to explore Cape Mulinuu with the nearby Lua Loto Ali’i Pool. This is a lovely spot to watch the sunset, soak up the view and swim in the crystal clear pool. Some of the world’s more spectacular blowholes are located at Taga. When there is a strong swell from the south the water sprays up in a massive plume. Locals will for a small fee throw coconuts into the blowhole and these can be shot 60 or so metres into the air. The beautiful Afu Aau Waterfall has crystal clear water running from the main waterfall into a large freshwater swimming hole fringed with ferns and tropical vegetation. The cool freshwater then flows into several smaller waterfalls and pools. The series of pools is a great place for a swim, a picnic or just to sit quietly and contemplate nature. Occasionally, during dry periods the waterfall stops running, but the pool is always a lovely spot for a swim.